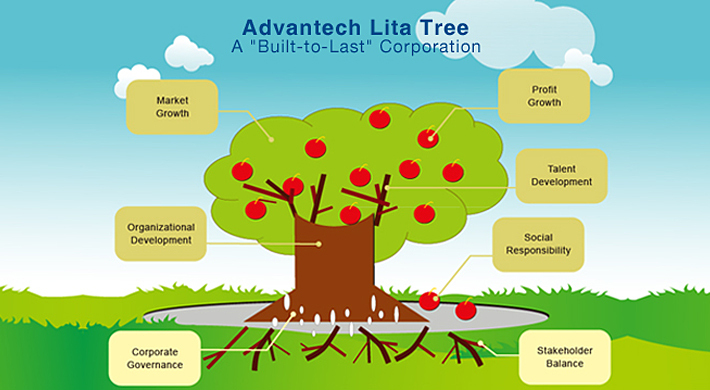 Advantech believes, a corporation is just like an LITA (altruistic) tree rooted in the earth. To make the tree grow strongly, sunshine, air, water, and nutrients are needed, none is dispensable. We think that perfect company governance and stakeholder balance will root the corporation deeply and establish a solid foundation. Sound organization development will grow into a strong trunk to support the corporation's operations; active talent cultivation will make the corporation flourish and expand with green shoots for market growth, and finally bear rich profitable fruit that the whole corporation can share together; and finally at last the fruit will drop to the ground to nourish the earth, so a corporation will also undertake full responsibility as a social citizen. Advantech believes in altrusim, and considers the "altruist LITA tree" spirit is the core value of the corporation. We believe, as a social organism, a corporation must sow good deeds with an altruistic spirit, and naturally gain unlimited blessings through a continuous virtuous cycle. Advantech is proud and conscientious about its social citizenship responsibilities, and is expected to lead the whole industry to a place where everyone can live and work in peace and contentment.